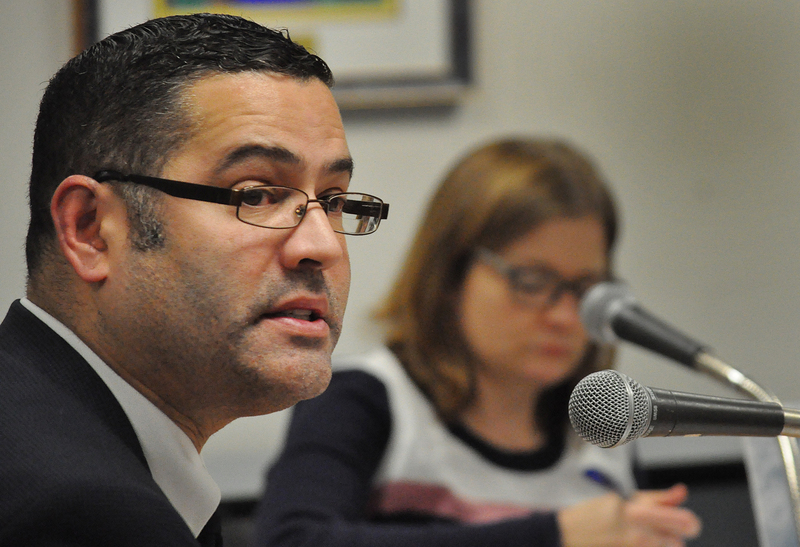 Norwalk Public Schools Chief Talent Officer Javier Padilla speaks to the Board of Education, Tuesday in City Hall. NORWALK, Conn. – The overall trend in Norwalk teacher absenteeism is heading in the right direction, Norwalk Public Schools Chief Talent Officer Javier Padilla said Tuesday. NPS started its study over concern about escalating substitute costs, Norwalk Superintendent of Schools Steven Adamowski said, during Padilla’s presentation at the Board of Education meeting. The study was commissioned as a priority implementation step in the Strategic Operating Plan, to understand Norwalk teacher absenteeism and compare it to state and national averages. Connecticut has the 12th highest rate of teacher absenteeism in the nation, according to Education Week, he said. District-wide, Norwalk’s average teacher absences dropped by 1.8 days in one year, from 10.3 in 2016/17 to 8.5 in 2017/18, his PowerPoint states. The Friday absences are down from 2,409 in 2016/17. “I have heard anecdotally that may be due to the fact that teachers, because they are trying to have that continuity of instruction, they will wait until Friday to schedule appointments,” Padilla said. There’s also a spike in May. May is a busy month for weddings, graduations and other events, Padilla said. Current state averages are not available, but NPS was at the state average in 2015-16 (9.6 average days) and above state average in 2014-15 and 2013-14, according to Padilla’s PowerPoint. Norwalk High School has the highest rate of chronically absent at 26, with Brien McMahon High School and Nathan Hale not far behind at 26, and Ponus Ridge fourth at 22. Chronic absences are defined as 10 days or more and does not include medical leave, Padilla said. According to his PowerPoint, nearly 75 percent of Norwalk’s schools have chronic absenteeism. The “generic body of research on absenteeism” shows that when employees have a sense of teamwork, rather than being lone rangers, attendance is better, Adamowski said. He added that districts which give teachers unlimited sick leave have less absenteeism because people don’t feel they are entitled to sick days. Norwalk teachers get 15 sick days a year and can roll them over to the next year, eventually getting a payout upon retirement, he said. BoE member Heidi Keyes requested more data, and questioned the motivation for taking days in May. It’s recommended that NPS keep working to refine its data collection, and enforce policies that are already in place, perhaps by elevating current human resources professionals with additional responsibilities, Padilla said. NPS will be meeting with teachers to understand their reasons for being absent. There have been discussions about the protocols used when teachers call in to announce an absence, perhaps changing who they contact, Padilla said. Stratford reduced its absenteeism by having teachers call their direct supervisor, Adamowski said. Another idea is to develop incentives for employees who have good attendance, and a third-party may be needed to assess claims of illness that require medical leave, Padilla said. Information on the rest of the workforce should be available by late January, Padilla said. It’s certainly appropriate to review teacher attendance, Norwalk Federation of Teachers President Mary Yordon said at the end of the meeting. “Teachers are highly committed to being with their students and maximizing instructional time and they do report to school under some pretty extreme circumstances, making sacrifices to be there, despite challenges of some types of illness” Yordon said. Teachers appreciate recent efforts to address health concerns stemming from the condition of various schools, she said, mentioning moldy tunnels and no heat at Cranbury Elementary School for several days. Not for nothing but the crossing guards can’t be much better, police log shows a lot of school crossings by uniform patrol units who most of the time dont like the job as well. Crossing Guards like teachers have a job and its the city who needs to make our kids get to school and go home safely starting at the door . Maybe another article on who gets paid what and if the police dept gets more money for a school crossing. Who actually pays for crossing guards? I know taxpayers but what budget? Does this include days that staff are sent to PD to enhance their instructional abilities, or when they attend meetings in central office? This data should not be included in the absenteeism data. NPS Chief Talent Officer? Huh? Principals don’t manage their buildings’ teachers? I really think we’re at the end of the Golden Age of Overpaid Public Education. It’s unsustainable. Anne, the data only includes sick and personal days, not days for professional development or other duties outside the classroom. Sarah, thank you for the clarification. Nancy, is there info on the number of staff included in the data? Broken down by school would be extremely helpful. Its about time this is addressed. Teachers have plenty of time after school to schedule appointments. Also, end this nonsense of banking sick days. We can’t afford this. There’s nothing more petty than bureaucrats bird-dogging sick days. Scarlet are you serious? What doctors take visits at 5:00? Teachers have an obligation to stay until 3:45 at the later schools. These days that’s about when your bus duty ends but you still have to go back to your room and straighten up from that days work and set up for the next day so that things are ready to go. Does anyone look at the fact that stressors may play a part in teachers increase in sick days? Many schools now have students who have extreme challenging behaviors such as hitting, biting, running from the school or classrooms, and it can take an extreme toll on the adults as well as the he students being impacted by this. There are schools where there are kids being secluded and restrained. There are schools who everyday you hear screams of terror and you see kids being hauled off by multiple staff members. This isn’t only at the high school or the middle schools. It is happening in the elementary schools as well. If the district wants info do an anonymous survey and get some answers to your questions.